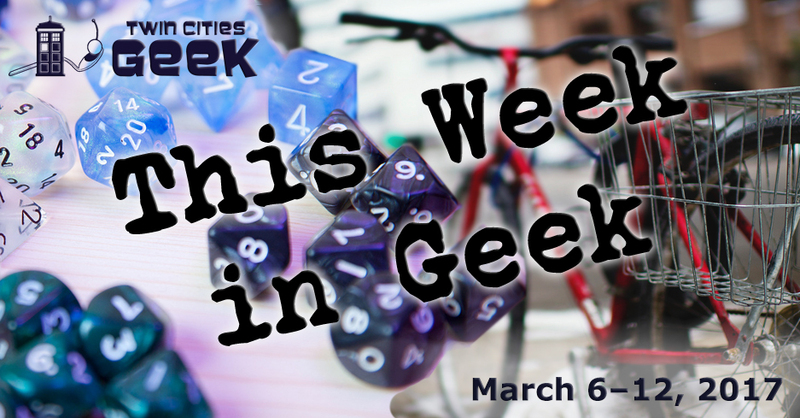 Welcome to This Week in Geek, your guide to events of interest to the Minnesota geek community for the week of Monday, March 6th through Sunday March 12th. The Minneapolis Institute of Art is hosting At Home with Monsters, a collection of paintings, drawings, artifacts, and concept film art from Guillermo del Toro’s home base in Los Angeles. The exhibit is organized around del Toro’s inspirations, including magic, occultism, death, and the afterlife. Click here for our article on this exhibit! When: Monday, March 6th at 6:00 p.m. The Geek Partnership Society will be stepping up to assist TPT in reaching fundraising goals with volunteers. Through your efforts, you can fund a service that helps keep the public informed. This event will entail connecting with the public over the phone, while on television; training will be provided beforehand, so there’s no need to be nervous if you’ve never done phone work before. Dinner and snacks will be provided. Lots of volunteers are needed, but per the event description, please only sign up if you are sure this is something you can take part in. When: Tuesday, March 7th at 5:00 p.m. When: Tuesday, March 7th at 6:15 p.m. When: Tuesday, February 28th at 7:00 p.m.
Come and experience YogaQuest, a blend of yoga and fanfiction storytelling led by certified yoga instructors. Experience a yoga workout experience and a story at the same time. See if you can convince yourself everything is awesome with this week’s theme: Fan Favorites! When: Wednesday, March 8th at 7:00 p.m. When: Thursday, March 9th at 6:30 p.m. When: Thursday, March 9th at 7:00 p.m. When: Friday, March 10th at 7:00 p.m. When: Friday, March 10th at 7:30 p.m. and Saturday, March 11th at 7:30 p.m. Fans of theater and The Dark Tower will be in for a treat with this play based on the same inspiration as Stephen King’s series: a poem by Robert Browning. In the play, Roland travels with a Seer into mystical and blighted lands to save his sister. Performances run March 10th through 25th and are listed in more detail on the event site. Tickets are $15 to $25. Where can you go to see Gothic romance, cowboys, and classical ballet all in one space? The only answer in the Twin Cities is the the Cowles Center on March 10th and 11th. This event is presented by Twin Cities Ballet of Minnesota and covers a mix of approachable works with connections to classic pieces. Highlights include a rendition of Aaron Copland’s iconic Rodeo. Tickets start at $25. When: Friday, March 3rd at 6:00 p.m. When: Friday, March 10th at 8:30 p.m.
Anime Twin Cities has joined forces with the Geek Partnership Society “to bring a little bit of fun to you on the second and fourth Fridays of each month with this co-sponsored anime club,” and at which they will show various anime movies and series. When: Saturday, March 11th at 10:00 a.m.
Come on down for the fourth FrankieCon at Frankie’s Chicago Style in New Hope. This small con is focused on collectibles, comics, and cosplay and is free for folks of all ages. See guests including local comic and collectibles shops, artists, cosplay groups, and more. There will be over $500 in prizes for this event. When: Saturday, March 11th at 10:00 a.m.–Sunday, March 12th at 5:00 p.m. When: Saturday, March 11th at 12:00 p.m. If you’ve ever been frustrated by inaccuracies on the Internet, especially in the age of fake news, this is the event for you. The goal of this event is to help edit Wikipedia articles related to art and feminism to make up for the site’s overwhelmingly male authorship, which skews content. Bring a laptop and a passion for accuracy, and the organizers will help you learn the ropes of editing Wikipedia. This event is organized by the American Craft Council, Hennepin County Library, Midway Contemporary Art, the Minneapolis College of Art and Design, the Minneapolis Institute of Art, and St. Catherine University. This board game night for one and all is hosted by the Source Comics and Games and put on by organizers Travis and Holly. There will be plenty of games on hand for this free event, and guests are encouraged to bring their own games to share. Come on down, relax, and play some board games. When: Saturday, March 11th at 7:00 p.m. The Geek Partnership Society invites you to attend a science-fiction double feature this Saturday night. If you can’t figure out what the films are based on the oh-so-mysterious descriptions on the event page, RSVP and find out the details in the confirmation email. When: Saturday March 11th at 1:00 p.m.
Monster-loving kids are in for a whole day of fun, starting with Guillermo Del Toro’s At Home with Monsters exhibit before moving on to a screening of Kong: Skull Island and ending with a gathering for pizza at Davanni’s. Per the event page, if you want to join the group, try for a 1:00 tour of the exhibit. When: Sunday, March 12th at 12:00 p.m.